Aquatic Capital is the fourth level in the Heroes story of Sonic Riders: Zero Gravity. A gleaming, chromium Venice, this watery city lies next door to Eggman's MeteorTech Premises, and is just as technological, if rather less evil-looking. Metallic canals twist and turn through a labyrinthine urban district, with artificial waterfalls and floating liquid orbs adding to the azure ambiance. This translucent course includes short-cuts along horizontal walls, and a trip through a sort of giant water-slide sluice system. Look out for the gondala-style boats while you're speeding along on your Extreme Gear; they may look flimsy, but they'll send you reeling unless you're a Power type character. In the middle of Team Sonic and the Babylon Rogues' confrontation with Eggman inside MeteorTech, Jet realises that his Ark of the Cosmos (and, incidentally, Amy and Storm) are missing. Proving himself unusually helpful, Eggman's satellite pinpoints the pair - along with the rebellious SCR-HD - in Aquatic Capital. While Sonic might typically avoid her like the plague, he's not about to let Amy get terrorised by a muscle-brained albatross and a possessed robot, so Team Sonic speeds away to save her. The level sees the player control Tails, with only Sonic and Knuckles as CPU 'opponents'. 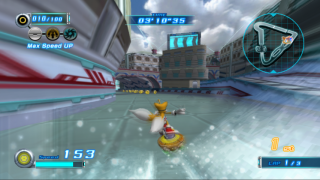 Beating the fox's teammates is not a requirement, however; just finish the course within 3'24'' to reach Amy in time. Team Sonic arrives to find that Amy's problems have solved theselves; the robot spontaneously compusted, and Storm looted the thing and took off. While Sonic and Tails ponder about taking down the Mother Computer, Knuckles and Amy piece together a clue from Storm's parting comments: that the Arks of the Cosmos have something to to with the Gigan Rocks.